Join the Columbia Gorge Sinfonietta when they present "The Bold, the Brilliant, and the Beautiful" at The Dalles Civic Auditorium this February. This program will be performed from 7:00 pm -8:30 pm on Friday February 20th, 2015 and from 2:00 pm - 3:30 pm on Sunday February 22nd, 2015. Learn details about this program presented by The Columbia Gorge Sinfonietta below. 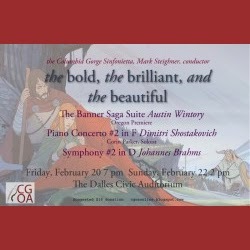 Come experience the power of great orchestral music, as the Columbia Gorge Sinfonietta presents “The Bold, the Brilliant, and the Beautiful.” The program includes the Oregon premiere (and only second performance worldwide) of Grammy-winning composer Austin Wintory’s “Banner Saga Suite,” stirring, Viking-inspired music with a cinematic flair. Dimitri Shostakovich’s rarely performed Second Piano Concerto will feature local soloist Corin Parker. The concert concludes with Johannes Brahms’ lyrical masterpiece, Symphony #2.